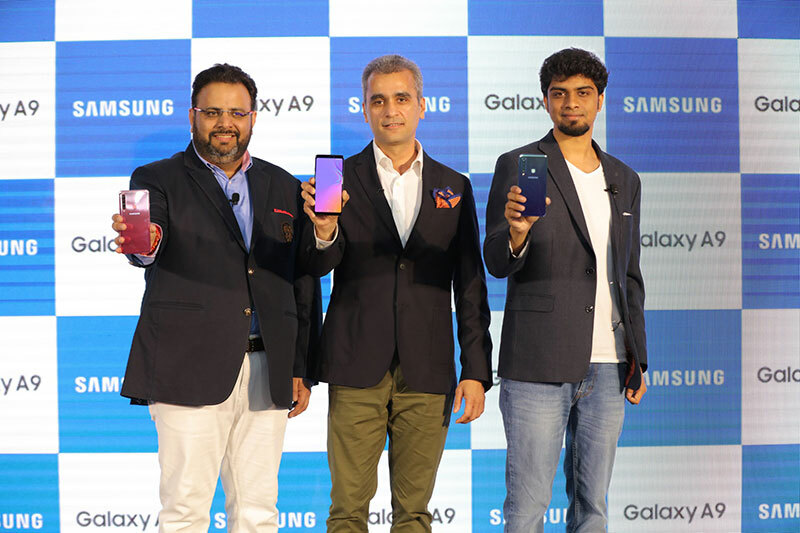 GURUGRAM, India – November 20, 2018 – Samsung, India’s most trusted brand, today launched Galaxy A9 in India, with the world’s 1st rear quad camera, stunning, dual tone, reflective gradient design, vibrant colours, scratch-resistant durable glass back, flagship infinity display and unmatched performance. Galaxy A9 comes with a larger and wider 6.3” Super AMOLED infinity display for immersive viewing experience which is further enhanced by Dolby Atmos surround sound making an ultimate entertainment device. The smartphone is powered by Octa-Core Snapdragon 660 processor and a large 3800 mAh battery with fast charging capability that gives you the high speed performance you need, all day, every day. Galaxy A9 is packed with Samsung’s latest, path-breaking camera innovations that enable consumers to do more, experience more and unlock more possibilities, every day. Galaxy A9 is the perfect companion for Instagram hungry millennials, letting them shoot in ways they could never do before. “As a leader in smartphone technology, we are all about meaningful innovation. For the first time ever, we have brought the rear quad camera with Galaxy A9. With ultra-wide, optical zoom, low light capabilities and live focus, Galaxy A9 has a camera designed for every moment in the life of the young millennial,” said Aditya Babbar, General Manager, Mobile Business, Samsung India. Galaxy A9 automatically recognizes 19 kinds of scenes and optimizes colour settings to suit the content—whether it’s a nightscape, a field of flowers, or a plate of food. Now you don’t need to worry about tedious details like colour saturation, white balance, and brightness. Enjoy the scenery, and let the Galaxy A9 do the hard work. Galaxy A9 also intelligently detects when there is a flaw in an image you just clicked (like closed eyes, facial blur or back-light) and notifies you so that you can capture the picture perfect moment. Galaxy A9 also comes with 24MP selfie camera with selfie focus and pro-lighting for clear selfies with studio quality lighting. For those who like to have fun on social media, Galaxy A9 lets you discover a new you with AR emoji. You can now create up to 36 animated emojis of yourself to add more expressions to your chats. The reliable 3,800mAh battery life on Galaxy A9 lets you live without limits and enjoy outstanding long-lasting performance. The phone will be available in two variants – 6GB/ 128GB and 8GB/128GB (Both expandable up to 512GB). Designed to make life more convenient, Galaxy A9 features Bixby, Samsung Pay and Samsung Health. Galaxy A9 allows you to take advantage of the many multi-tasking benefits, including App Pair that allows users to launch two apps at once on a split screen, thereby providing the option to multitask. This feature is accessible directly from the Home screen of the smartphone. The device also comes with Face Recognition technology – just hold your phone as if you are taking a selfie and it unlocks for use. Building on Samsung’s heritage in first-class design, Galaxy A9 comes with a unique, dual tone, reflective gradient design crafted through a special anodizing process, designed specifically to achieve the most refined, premium finish. Galaxy A9 is styled in three unique colours; Caviar Black, Lemonade Blue and Bubblegum Pink with a sleek and ergonomic design, that fits in one hand with a 3D Glass curved back for a high-quality comfortable feel. Galaxy A9 6GB and 8GB will be available at INR 36,990 and INR 39,990 respectively. Consumers can pre-book Galaxy A9 starting today and the device will be available across all online and offline channels starting Nov 28.